I have worked with many non swimmers who tell me they are afraid of putting their faces in the water. Although it is a common fear, putting your face in the water is easy and almost everyone can do it without a problem more or less straight away. I have never, ever had anyone finish a lesson without being able, quite happily, to put their face in the water. I tell them to hum a nice song. That way their mouth is closed and the air comes out of the nose, and they are also a bit distracted. They may be afraid of seeming foolish but in the water no one can hear you anyway. A much more persistent fear, and one that is much more difficult to let go of, is the fear of floating. It is not usually an inability to float that is the problem, that is only very, very rarely the case; rather it is the fear of being ‘untethered’ and free. We are so used to holding on in life, that to let go and float is very difficult for some people. One woman said that it felt like the moment when you are falling asleep and you suddenly catch yourself and wake yourself up with a start. This made a lot of sense to me. Similarly in the water, you are letting go and allowing yourself to float freely and for a non swimmer this can be an unfamiliar and frightening experience, and it can feel like falling if you don’t realise that the water is there to catch you. Not everyone can overcome this fear quickly. For some people it can take a long time to let go and trust the water. This is true for children as well as adults. Sometimes people are OK as long as they have something to hold on to. One pupil could swim as long as she was holding my hand, another one was fine as long as she could touch me with one finger. But as soon as I took my hand away, even though I was not supporting her at all, she got that falling feeling and was snatched by a panicky fear . A woman I was teaching last week who had been rather quiet until then told me she had just come back from a Kite festival in France. 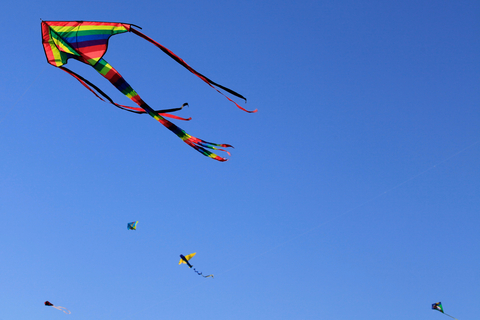 It sounded so beautiful watching all the colourful kites flying high up in the sky. I told her that swimming is the closest you can come to flying in scientific terms, and it is. This entry was posted in learning to swim, swimming science. Bookmark the permalink. Jane, have you found that after their first attempts at submergence, if people are gently holding a normal breath instead of ‘moving’ by humming they can bring more of their awareness into experiencing a float?